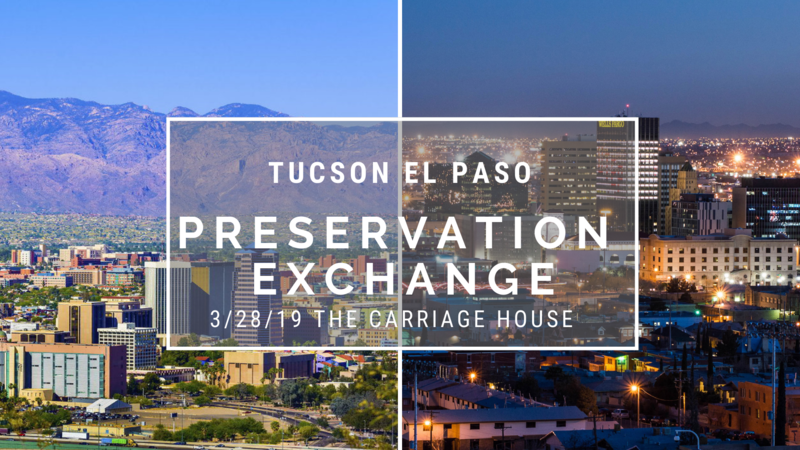 Join us for the Tucson – El Paso Preservation Exchange on March 28, 2019 at 8pm! Traveling the Trost Trail is coming to Tucson, and we want you to join us for a panel discussion with resident historic preservation experts Brooks Jeffrey and Bob Vint, along with our El Paso coalition of preservationists and history lovers! We will be at the Carriage House, which is offering a menu based on the City of Gastronomy cuisine. The dishes selected feature flavors and ingredients that are unique to our region and are fine examples of why Tucson was selected as UNESCO’s first City of Gastronomy in the United States. Ticket prices include dinner and a $25 donation to the Trost Society. Please let us know if you have any dietary considerations, questions, or would like to join us for the full Traveling the Trost Trail event by emailing malissa@trostsociety.org or calling us at 915-703-3151. Principal architect Bob Vint is a native Tucsonan who has practiced as a licensed architect in Arizona, New Mexico, Texas, and Massachusetts. He received a Bachelor of Architecture with High Distinction from theUniversity of Arizona in 1982. After working with various architectural firms in Boston and Tucson, he established an independent practice in 1993. Bob serves as preservation architect for the Mission San Xavier del Bac in Pima County, the most significant historic building in Arizona (dating to1783, built of low-fire clay brick with lime mortar), as well as for the pre-historic Native American Cliff Dwellings of the Sierra Ancha in the TontoNational Forest (dating to 1290, built of stone with mud mortar – preservation study carried out for the U.S. Forest Service.) Additional projects of note include design of the San Xavier Franciscan Friary and Mission School, Linda Ronstadts’s Tucson residence, the main entrance of the Arizona Sonora Desert Museum, the mixed-use Plaza San Agustin in downtown Tucson, and the St. Michael’s Campus Master Plan, Classrooms and Student Center. Vint is the author of a book on affordable housing in the Southwest published in 2005 by the Department of Housing & Urban Development, Southwest Housing Traditions: Design, Materials, Performance. Since2011, Vint has taught at the University of Arizona’s College of Architecture, Planning & Landscape Architecture as a member of the adjunct faculty. His courses at the U of A include the History & Theory of Urban Design, AridRegion Urbanism (featuring field trips throughout the Southwest) and an interdisciplinary downtown design studio. Mrs. Margaret Smith is the granddaughter of Gustavus Trost and great-niece of Henry C. Trost. She is the Trost family archivist and founder ofwww.henrytrost.org, the only website providing a complete list of buildings designed by the firm Trost & Trost. She conducts research on Trost buildings and educates the public about her family’s legacy. Mr. Bernie Sargent is Chairman of the Board for the Trost Society serves on the boards for seven other El Paso- based organizations including BOAC and Keystone Heritage Park. He is also co-owner of Border Group and Sargent Inventory Services.